Cute simple outfits are perfect for busy woman on the go. We all want to look good but getting dressed every morning can be so frustrating. Studies show that women an average use one year of their life determining what to wear. Ack! I can think of many more things I would rather do with my time than pick out clothing. Determining what to wear can also lead to decision fatigue. This is a real psychological condition in which a person’s productivity suffers as a result of becoming mentally exhausted from making so many irrelevant decisions. In other words, by stressing over things like what to eat or wear every day, you become less efficient and burnt out. This is where a capsule wardrobe or a mini capsule wardrobe can make your busy life easier. 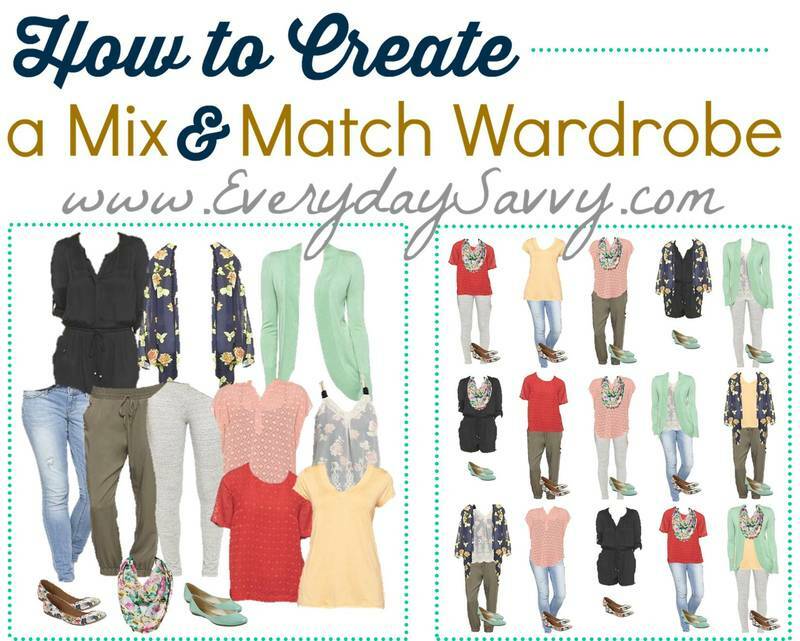 By having cute simple outfits in your closet already matched you can look great in less time. Every month, we share a few mini capsules wardrobes full of cute simple outfits to give you inspiration. We share 15 outfits that you can mix and match. These are not a full capsule wardrobe because they don’t include workout clothing and special occasion outfits. However, you will be shocked how these cute simple outfits can be perfect for most of your everyday life. We highlight business casual outfits for the office and more casual outfits that are perfect for busy moms. We highlight outfits for plus size women as well. I had always been turned off by capsule wardrobe because many of them or don’t include color or pattern. You will see our mini capsule inspirations include lots of pops of color and pattern. You can easily use items already in your closet when making or adding to a capsule wardrobe. This saves you money. You will also save by being intentional in what you purchase vs just buying a piece here and a piece there. In other words, a mini capsule wardrobe saves you time, money and stress! We even created a guide to help you make your own mini capsule wardrobe full of cute simple outfits. Don’t believe me that a capsule wardrobe can simplify your life? Listen to what some of our readers have said. I think they might just convince you to give a mini capsule a try. I cut out your pictures and tape them to my closet wall of the capsules I’ve purchased from for inspiration. Sometimes I already have similar pieces which is why I don’t need them all. Also, when I look at them like this, there’s actually some overlap in the style of many of the pieces. There are similar leggings in 3 different capsules, and khaki ish pants in 3, 3 with similarly colored plum shirts, 2 with magenta colored shirts and of course jeans overlap. I like that there is a pattern here, so that I don’t feel like I need to buy everything. I appreciate your work on these. It’s helped me feel better about my clothes. I just received a big box from Loft with most of the items from the capsule. They have been dubbed my ‘Garanimals’ by my husband. And I LOVE them! The concept, the choices, everything! Thank you for making my fall wardrobe so easy to select! Thank you for your style section on wardrobes on your website! I came across the idea of the capsule wardrobe, like most people, accidentally when I was trying to figure out what to take on a 4-month vacation to Texas where I would be visiting and living with family. My fear was bringing to much and of course not bringing enough and I wanted to be able to live out of a suitcase since I would be coming and going many times and living with others. Was that even possible? I also wanted a wardrobe on a budget with today’s style. I found the fall Target wardrobe you put together and I decided that since I already had a few pieces I could make it work. I followed the options and matched what wasn’t available anymore the best I could and pieced together a very small, definitely can fit in one suitcase, I started this adventure in September, packed my wardrobe, have lived in Texas for the past 4 months and have successfully worn and adapted to my wardrobe and haven’t bought one new thing. What I have loved most about living on a capsule wardrobe is not having to think about what I am going to wear. Dressing in the morning is no longer a chore or a stressful event, it has eliminated the work that used to be involved in an everyday task. As the seasons change I will be using your recommendations for the spring and am looking forward to what you come up with! Hi Melissa! I have bought half of the 2017 JCP Spring Capsule & am so excited! I’m soon to be a SAHM & don’t want to look a mess, I still want to keep some style. This capsule is perfect! I can’t wait to buy the other half. What I did – sold more than half of my current wardrobe, I only kept a handful of church dresses & I put away some pieces I feel might come in handy for another capsule. So far this capsule hasn’t really cost me anything. Thanks for putting so much into this, I love it! Why not give a mini capsule wardrobe a try and cut down on the stress in your life while still looking great! Be sure to grab the guide for how to make your own capsule above or below. There is a picture for a DIY wordrobe capsule. I have tried twice but all I get is some sort of message from convert kit. Is there a guide for DIY wardrobe capsules? When you sign up for the email list (convertkit) . I send you an email with the how to make your own mini capsule guide. Hope that helps!